Teeth discoloration can reduce the brightness of your face and make you look older than you are. Getting your teeth back to their natural color is important to ensure that your teeth don’t get stained permanently and you remain radiant and youthful always. At Somi Dental Group we use the KoR teeth whitening system, the latest in teeth whitening technology to provide treatment. Our teeth whitening South Miami team specializes in getting back your flawless, white teeth. 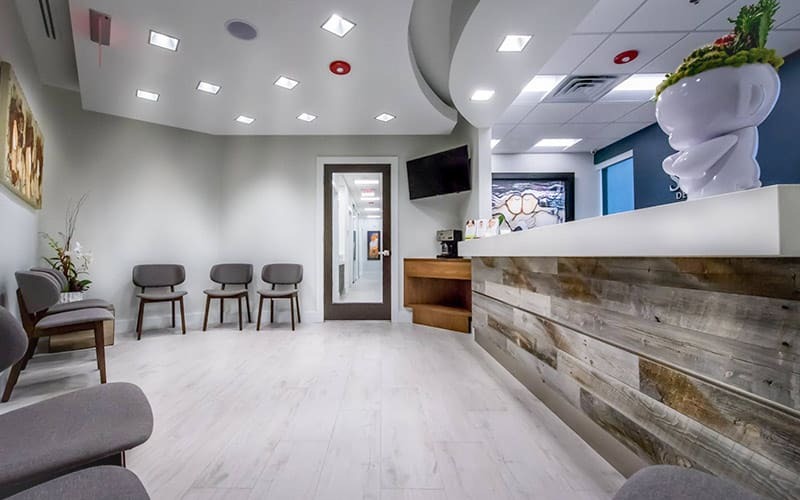 The team at Somi Dental Group & Orthodontics, led by head practitioner Dr. Arnaldo A Lopez (DDS), have extensive experience performing teeth whitening on children, preteens, teens, adults, and seniors. If you’re interested in learning more about this treatment or would like to schedule a consultation with Dr. Lopez, please reach out to our dental clinic in South Miami. WHY DO TEETH BECOME YELLOW? Teeth turning yellow is an indication that the inner layer of your teeth – the dentin – is being damaged and discolored. As your dentin continues to get discolored, it starts looking more opaque, finally showing through the transparent enamel layer. Sometimes, extensive exposure to colorants will also stain the enamel, leading to dark brown or yellow teeth. Regain your pearly whites today! In this procedure, the outer layer of the teeth – the enamel – is whitened. To do this procedure, the dentist may use a variety of products like dental bleach, whitening strips, whitening toothpaste and so on. The choice of the material used depends on the type of whitening the patient wants. You can speak to our dentists for advice on the various whitening products available for enamel whitening. In this procedure, hydrogen peroxide gel is applied to the teeth in order to lighten the discoloration of the inner dentine layer of the teeth. The dentist will apply a layer of this whitening gel and will allow your teeth to soak up the chemicals which can bleach the yellowing on the dentine. Over a few sessions, the color of your dentin will become lighter, thereby resulting in your teeth looking whiter through the transparent enamel. The dentists at Somi Dental Group & Orthodontics use the KoR Whitening System during the teeth whitening treatments. This particular product has a deep cleaning and deep whitening effect on the teeth, which isn’t found with other whitening treatments. The KoR Whitening System involves the dentists first applying a specially-designed hydrogen peroxide gel onto your teeth, to break down the bacteria and molecules responsible for the discoloration. Next, the dentists provide you with a snug-fit whitening tray, which you need to wear at night for the prescribed period and which works on your teeth while you sleep. The whitening trays used during the KoR treatment are custom-designed to fit your teeth. Your dentist will take proper measurements and conduct a fitting session to ensure the trays fit your teeth properly before starting the whitening procedure. Never choose teeth whitening treatments when you have an exposed root, cavities, infection or injury. The teeth whitening agents used may burn or further damage the already weak and diseased tissues and nerves, causing extensive damage to your teeth. Additionally, if you’ve had veneers or crowns put in, you may not be an ideal candidate for teeth whitening, since the agents will further whiten your already-white crowns and veneers, making your teeth look fake. Your dentin is sensitive, to begin with. Your enamel becomes sensitive over time due to discoloration and stress from chewing. So, when you apply a whitening agent on your teeth, your already sensitive teeth will turn overly sensitive to pain. Some patients report the first 24 hours to be extremely painful. Due to this, you may not be able to eat much, although each patient’s experience is different. An OTC pain medication can help. If you’ve already had your teeth whitened at the dentist’s office before, you may be tempted to try to do it yourself at home and save a few bucks. Our advice, don’t. Most whitening agents contain harmful chemicals, which when ingested, can cause severe nausea and vomiting. The dentists at Somi Dental Group & Orthodontics use the highly-specialized KOR Teeth Whitening System, which includes gel and seal trays. These have been designed to provide long-lasting results. While whitening does help reduce the discoloration of the teeth, the results aren’t the same for absolutely everyone. Factors like extensiveness of discoloration, duration of discoloration, patient’s lifestyle and the treatment sought will determine how much of the whiteness is regained and how long it lasts. But, irrespective of these facts, it’s important to know that whitening isn’t a one-time procedure and that you’ll need to visit the dentist once every year or two for treatment. While teeth whitening is generally safe for adults, parents are often concerned whether the same will be true for their kids. Can their children get their teeth whitened? The child has already lost all of his milk/baby teeth. The child has already grown his entire set of adult teeth, and no other teeth will grow/erupt now. The child does not need any orthodontic treatment or has completed his course of orthodontic treatment already. If your little one meets the above requirements, he can go ahead and get his teeth whitened. Our dentists at Somi Dental Group & Orthodontics use only whitening trays for pediatric teeth whitening, as it is inherently safer for children than other whitening agents. These trays do not contain any chemicals which may be poisonous for kids, and they don’t affect the child’s oral health. If you’re interested in getting your or your child’s teeth whitened, feel free to consult Dr. Lopez. We offer some of the highest quality teeth whitening South Miami has to offer and have had hundreds of successes with our patients. Contact us today to find out how we can help you get the stunning set of teeth you’ve always wanted.